I've noticed a recent spike in hits to my famous Fired for Blogging post, in which I broke the story of Friendster's stupidest move and tracked the growing coverage for a few days. So I decided to investigate a bit. 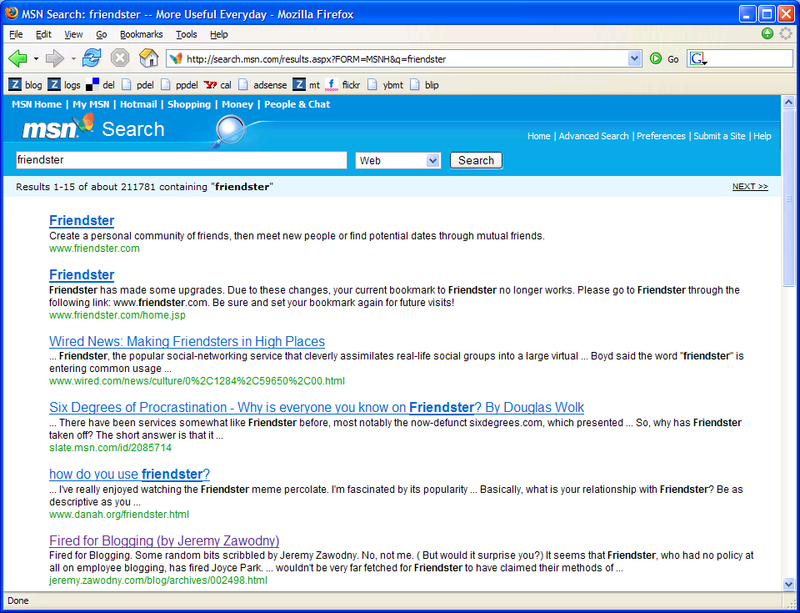 It turns out that much of the traffic is coming from MSN Search, where a search for friendster yields that posting just "above the fold" in the #6 position. Note to MSN Search: consider numbering the results. I shouldn't have to count to figure out that this was the 6th result on the page. Anyway, I've captured the moment in the screenshot at the right, just for kicks. Oh, here's a quick side note. Not surprisingly, Friendster continues to lose smart employees and, rumor has it, many more are currently shopping their resumes in the valley. Note to Friendster engineers: we're hiring. Ping me if you're interested. After I read your "Fired for Blogging" post, I started graphing the number of hits for that phrase in google. Probably should have done "friendster" as well, bah. I think it's fired up the blog reading again on this subject. Lots of stories about people and job conflicts and blogging so it's a highly searched term, it seems. It's not always the employer that's the bad guy in these cases, at least from what I've read, so maybe not a broad brush is warranted in these situations. #6 on Yahoo too. Wait....doesn't Yahoo power MSN (currently)???? Interesting. BTW, just curious, are you working in Yahoo! or running Yahoo!? Apologies for breaching comment policy (OT).